Ken and I were enjoying our ritual coffee on the front deck this past week when Ken spotted an unusual bird landing in our aspens. Luckily we had our binoculars on hand and were delighted to see a tiny pygmy owl! We weren’t given much time to look at him before he flew off to another destination. Figuring we wouldn’t be lucky enough to find this owl again, but deciding to try anyway, we went searching. We got lucky and found not one but two owls perched about 10 feet up in some other aspens. We had camera in hand so took several shots from afar before trying to venture for a closer look. This pair seemed as curious about us as we were of them and allowed several photo shoots from about 3 feet away. They gazed at us with their wondrous eyes, preened and posed, all for the camera of course! When our awesome visit with this pair ended, Ken did a search to find out more about this owl using an app he purchased called iBird Canada. Ken keeps a log of the birds we see and discovered that we had seen another pygmy at the same time last year. 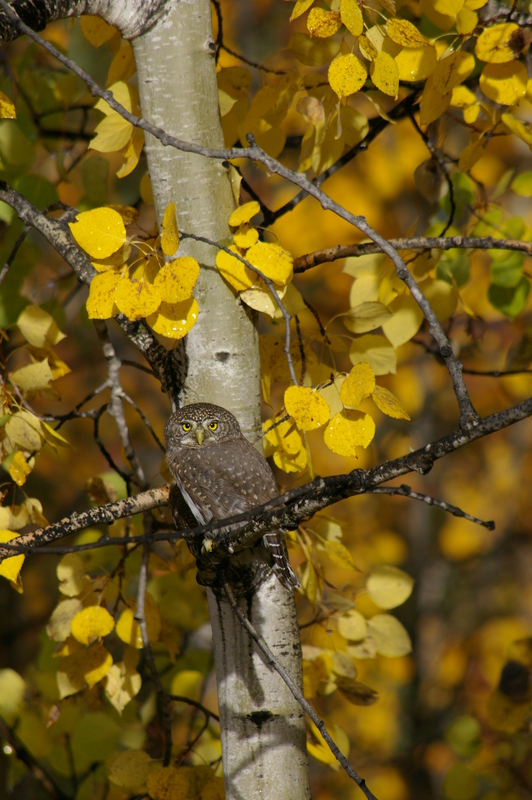 These owls are common around the Sundre area of the province. 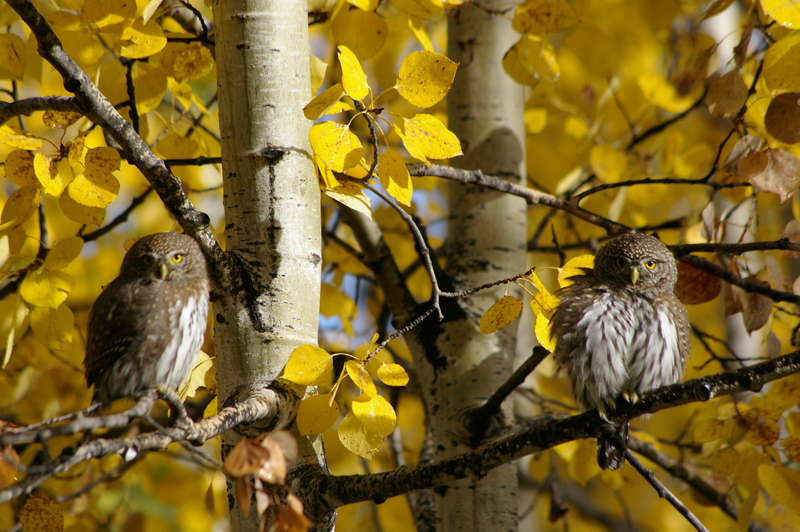 Northern Pygmy Owls are active during the day which gives us a good chance of finding them. Listen for their high, evenly spaced hooting calls or watch for a commotion of small agitated songbirds and you might see this owl in their midst. 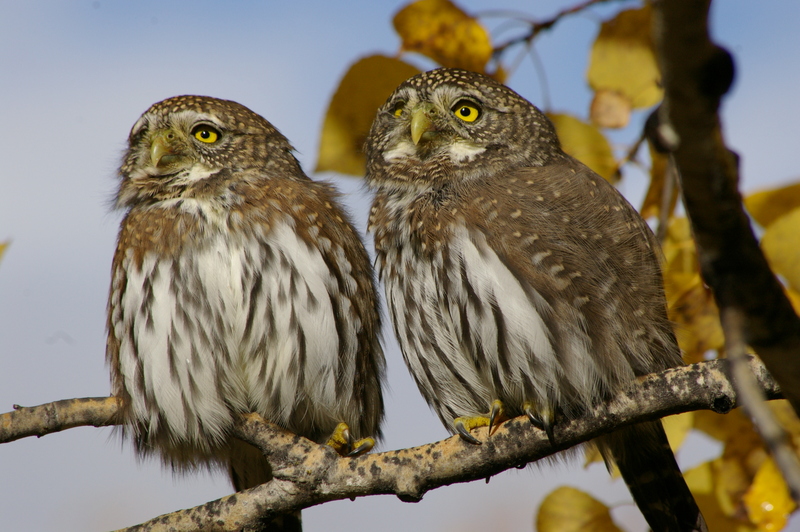 To quote iBird Canada,” These owls can carry prey weighing more than twice their own weight. They often eat only the brains of birds and soft abdomen of insects.” Yum! 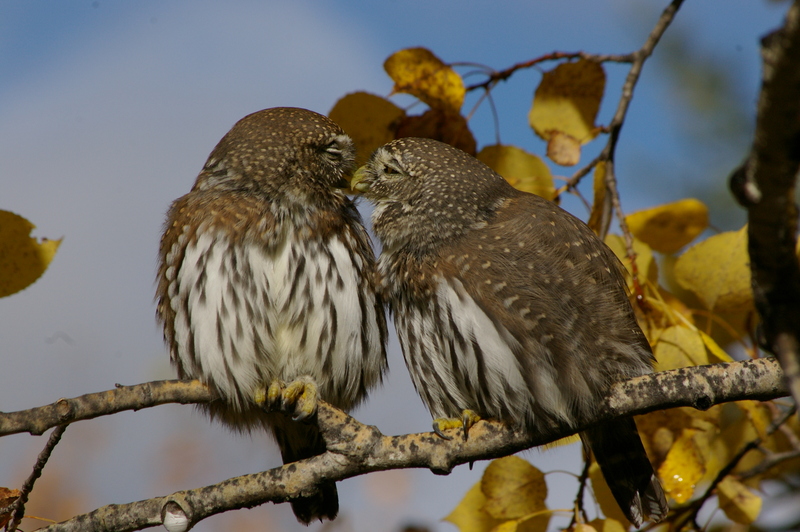 The pygmy owl is about bluebird size and often use a woodpecker hole to nest. They lay 2-7 white eggs, take about a month to incubate and another month to fledge. We think they were attracted to our place because of the numerous birds we attract with our birdfeeders. Thankfully, this pair didn’t drop in to dine at our birdfeeder…not this time anyway.